Recently, we held a seminar for our customers helping them better understand the costs related to either SharePoint Online (via o365), or SharePoint On-Premise. As such, we came up with this 50-user costing senario, and broke it back down into a “monthly per user, per month” charge. I think it gives our customers a good understanding of the costs involved, and the potential savings, when they move to Microsoft’s Cloud offering. The slide below is our 50-user comparison. The pricing model assumes you do not already “own” On-Premise licenses. 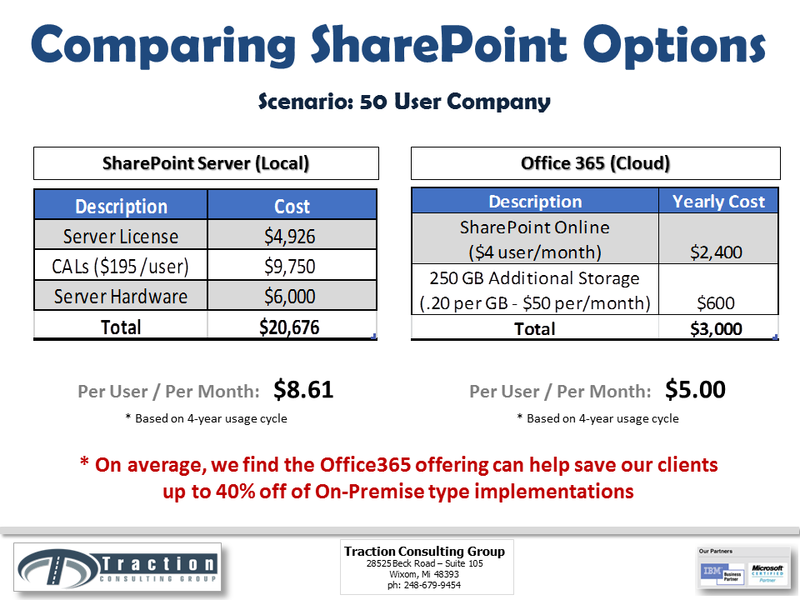 As the slide above illustrates, on average we see savings for our clients of around 40% when implementing SharePoint in the cloud (versus Local). What this calculation doesn’t include is the additional patching/system updates that a typical Administrator would have to handle for Local installation. Pretty strong statement from Microsoft – basically, they are giving you the hardware for free, and charging you the software costs monthly (instead of being hit with a larger up-front cost). In my next series of posts, I will be in focusing how we are leveraging SharePoint to help our customers manage vendors, contracts, work orders, and other “operational-based” workflow – by pulling it out of email, and tracking it in SharePoint. Stay tuned. Recently I was trying to set up a scheduled task in Windows Server 2008. I set it up to run later in the day and everything seems self explanatory. The next morning I checked to see if the task ran fine or not and I found out that it “ran” but it technically didn’t. In the history of the scheduled task it shows that it executed the task, but when I checked nothing had changed. I double checked all of my settings and everything seemed fine. I even executed the batch file in the cmd prompt and it worked just dandy. I noticed a field under the action tab when you are editing or creating an action, it says ‘Start in (Optional)’ I decided to try it and put in the directory of where the batch file was located. I then ran the task and it magically started working. Now, I know this doesn’t make complete sense because you already have to browse and locate the batch file under ‘Programs/Scripts’ But hey, it wouldn’t be Microsoft if it was made easy. I recently had to work on an Apache Web Server and had to bind a couple of IP Addresses to a site. There isn’t a UI for Apache. So for me to be able to bind an IP Address, it took some research. In IIS, there is an option to bind an internal and external IP Address to a site. So, going from IIS to Apache was definitely a challenging task. I would just get Apache to work and then it would break, but I have it this time. In order to bind an IP Address in Apache, you have to edit the httpd.conf file. From what I have gathered, if you have an internal and external IP Address for one site you have to create them as Virtual Host. In the middle of my research, I did find that you would create a Virtual Host if you were wanting multiple sites using the same Port. Let’s say I have an Internal and External IP Address that I have to bind to one site and they are both using port 81. You would start off with stating what the IP Addresses are and their port. Then we need to state the IP Addresses/ports and tell it where to look for that sites index. html file. It will look like this without all of my comments. 1. Verify that Office 365 is working correctly and we can send and receive emails. 2. Create forward rules from Lotus Notes to Office 365. We still have many Lotus Notes applications that were not migrated at the time of the email migration. We setup a forward rule in Lotus Notes’ address book to forward to office 365 addresses. 3. Import external contacts from Lotus Notes directory to Office 365 using PowerShell script. The external contacts are clients or vendors email addresses and phone numbers that we share between the team. Since there is no UI tool to allow us to do import the contacts in Office 365, we had to write a PowerShell script to import the contacts. 4. Previous calendar entries had to be manually created in Outlook for each user. 8. Import/manually enter personal contacts that were created in Lotus Notes. I was recently imaging some computers, in which I have done before. I was imaging them from Home Premium to Professional. Usually I can find drivers on their website with no problem. I went to go download them and found out that they are not available. I called HP to see if they can tell me where I can find the drivers, instead of me searching all day on the internet for them. I ended up being transferred a couple of times for a tech to be extremely rude to me. So my word of advise, before you image a machine look to see if you will be able to find the drivers. If you cannot find the drivers, upgrade the version of Windows instead of installing a fresh copy of Windows. It will save you a lot of time and frustration. After you upgrade the version of Windows and you have installed all of the software, create a new image. Then use that new image to re image the rest of the computers. The “Health Report” I’m working on keeps a log of the current status of all scheduled Lotus Notes agents and ETL synchronization processes between Lotus Notes and SQL server. Every day the key users are sent a table where anything that is in Red Text needs to be reviewed and anything Green is running normally. By using the same tools we export data from Notes, I can update a notes document on failures or completions to keep track of the status of the jobs. This allows me to track scheduled jobs from the different technologies in a single location. I’m In the process of building a more advanced form of error catching for a customer. When completed, they will be proactively notified of the current status of all scheduled processes (from multiple technologies) and will also have the ability to see the current status of all critical tasks in real time quickly and easily without having to search through any logs. Just an FYI, if you are trying to put an existing VM in Virtual PC 2007 and the VM was created on your windows 7 machine using Virtual PC; you may get an error. I received this error anytime I tried attaching an existing virtual hard disk to a new VM in virtual pc 2007. So, if you just copy that file from your windows7 machine and copy it to the machine using Virtual pc 2007, it will work. Also in virtual pc 2007, if you are trying to add a VM that is a .vhd file; you have to create a new VM and then add an existing virtual hard disk. It will let you use the .vhd file there. Everyone here at Ebiz is excited to know that we are getting new PCs! BUT, before we can set them up at the workstations, I need to image them. Today I downloaded clonezilla, it’s free, which is a plus. They also have step by step documentation (with Pictures!) on how to clone an image of your pc. There is an option to take the image from your hard drive and put it on an external hard drive. No problem, right? Except for the fact that our external hard drive will not work. I keep on getting a redundancy error whenever I try to initialize it. I googled this issue and found out that it is because of corrupt data being on the hard drive. I also tried following their step by step process to fix the problem, with NO LUCK. As I was bummed out about the hard drive, I started looking further into clonezilla. To my surprise, it doesn’t look like you can even restore an image from an external hard drive to the local drive. Maybe I will try symantec ghost and see how that goes.